The blade was polished by high ranking polisher. Blade length : 74.9 cm or 29.48 inches. Sori :1.4cm or 0.55 inches. Width at the hamachi : 3.26 cm or 1.28 inches. Width at the Kissaki : 2.09 cm or 0.82 inches. Kasane : 0.8cm or 0.31 inches. and longer kissaki healthy gorgeous sword. Jigane :Koitame had and mokume had mixed like Hizen style texture. There are small 2 Kizu at 10cm from the Kissaki. Bo-shi is sansaku style noter and round shape. and learned sword making technique from his master Masayoshi. Masayoshi and Masamori and also Yoshinori. and 2 swords became Jyuyo Token. I think Yoshinori helped a lot for his master Masayoshi. 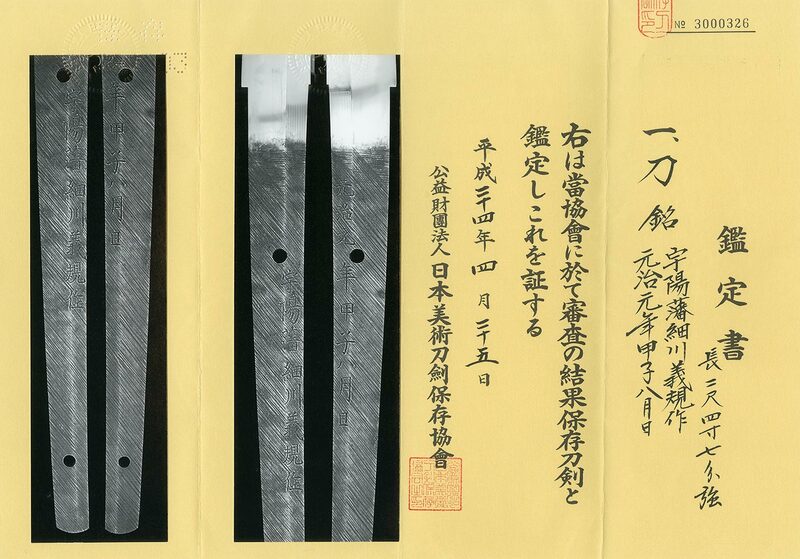 sword makers are very clean nakago which is made very clearly and carefully. The hamon is also careful made Cyoji midare hamon. The blade is long attractive nice shape. after arrived of the black ship of Commodore Perry. Aoi Art estimation paper :NBTHK Hozon paper.